Up for grabs. 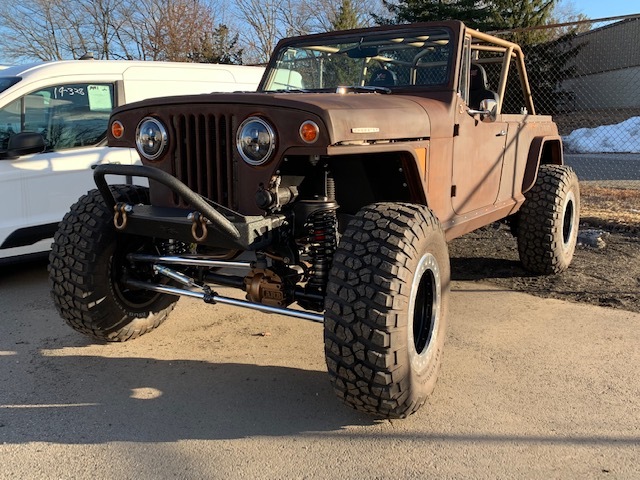 A 1967 Jeepster Commando, based on a 2013 Jeep JKU chassis and drivetrain. It is equipped with the factory Jeep automatic transmission and 3.6l V6 and has a current mileage reading of 56,000. “Rust” patina is a completely custom paint, under the rust is primer which protects the metal from breaking down over time. Every gasket, emblem, and piece of glass is brand new. The body has been armored with 3/16 plate and custom built flares at all four corners. Suspension is completely adjustable, via the 3.5” Teraflex kit with Bilstein shocks. The soft top is brand new from Bestop. Fully caged, painted textured gold. Suspension seats, and a JK gauge cluster finishes off the interior. This rig rolls on a set of ATX Slabs, with 37” BFG KM2’s. The seller is asking $60k USD.